It has spawned a wider movement called Cool Neighbourhoods, which seeks to replicate and expand this innovative grassroots model, offering free thermal imaging to local residents. 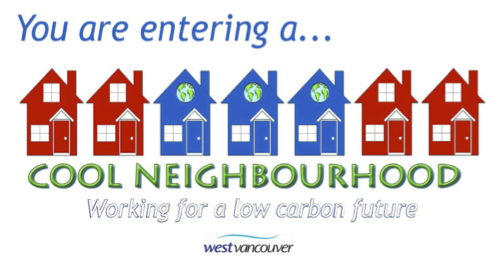 Cool Neighborboods are not the only ones to see the potential of thermal imaging with carbon reduction campaigns. 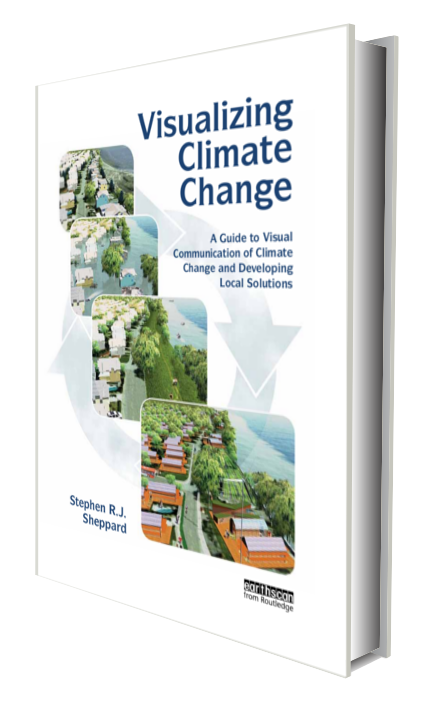 Volunteer efforts across the UK have applied these visualization technologies to motivate collective climate action at the neighbourhood scale, as in Challenge North Leigh , and the Sustainable Wallingford campaign pioneered by the influential and sadly missed Jacinta Thorley. 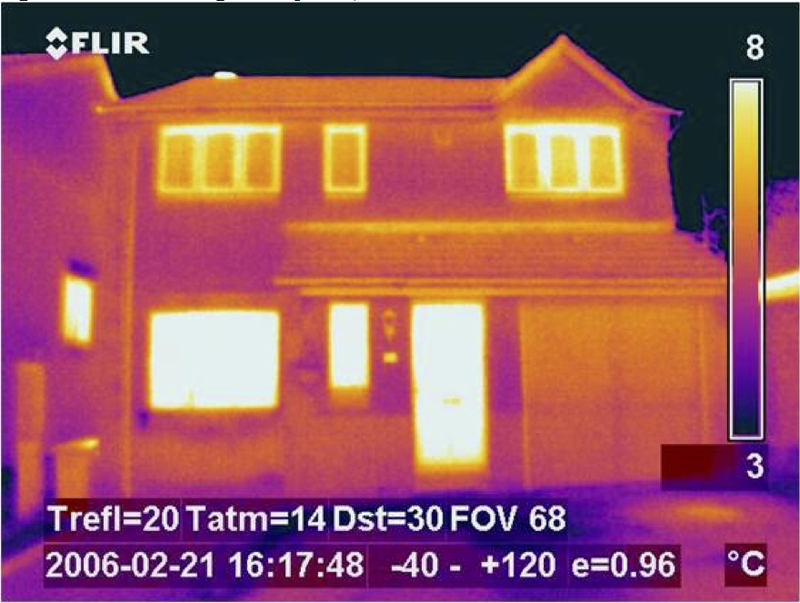 Researchers at University of Plymouth’s Psychology Department have also documented the substantial motivational effect of thermal imaging, well over and above conventional energy audits. Ground-breaking studies by Dr. Julie Goodhew and Dr. Sabine Pah (2009) found 29% of the households shown thermal imaging reports took action to modify their carbon emissions, compared to a meagre 6% of households that took action when receiving the regular energy audit without thermal imaging. While Dr. Pahl was visiting BC, we tagged along on a thermal imaging session at a home on Eagle Island, and were able to observe up close the transformative effect on the homeowner when an energy expert used the infrared pictures to show him the heat loss from his doors, windows and gaps in roof insulation, none of which had been visible to the naked eye. It was a dramatic moment – the information was crystal clear, vivid, immediate, credible, personal, and meaningful. It was also backed up with specific recommendations on how to fix the problem and a team of friendly neighbours organizing a low-cost way to get the work done. 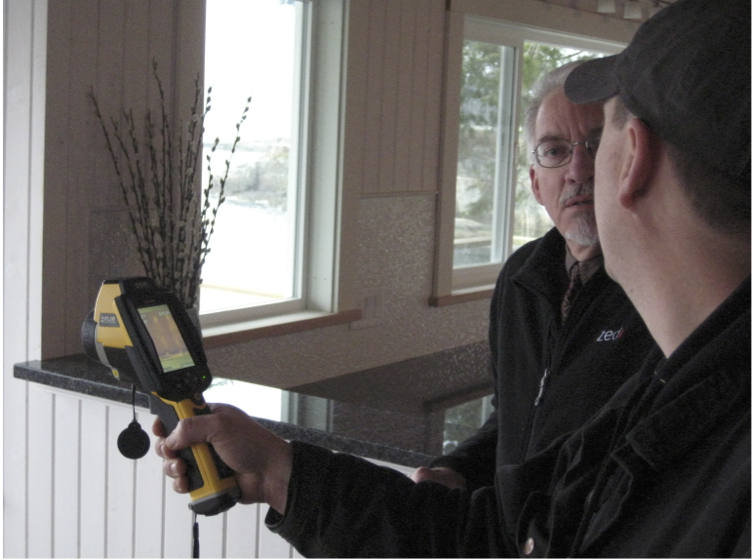 Thermal imaging expert conducting real-time assessment of heat loss with hand-held infrared camera. The householder is actively engaged and immediately understands the heat lost with the images provided. With the support of his neighbours and the powerful information at hand, it was easier to do the right thing than not to do it. I left that house convinced that, if everyone had access to this kind of social support network and compelling visual technology, we could cut residential carbon footprints massively at a fairly low cost – and perhaps meet the carbon reduction targets that progressive cities have set for themselves. Grassroots movements like these take considerable volunteer effort and organization, and do best when reinforced by government incentives for energy conservation and municipal support (as in the case of Eagle Island). Local government has a key role in promoting community efforts and providing guidelines for the reduction of carbon emissions. The City of West Vancouver set a great precedent with the support spreading awareness and encourage home retrofits amongst the residents of Eagle Island. Most people want to make their world a better place, they just either don’t know how, don’t have time or just can’t afford it. This is dinner/cocktails/tea with the added advantage of someone offering to do something for them. … Plus the community gets stronger. It is great to know that I can ask my neighbour to feed my cat when I am away… .